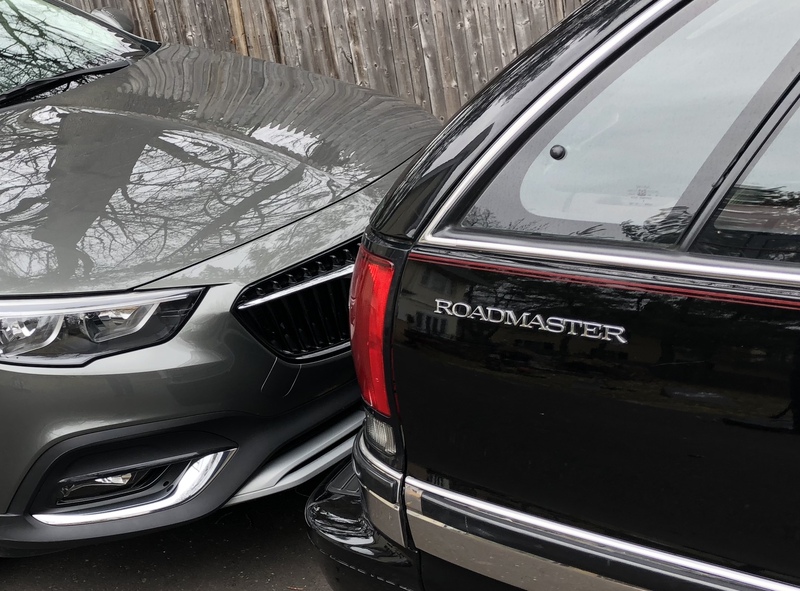 Almost every article and review about the new Buick Regal Tourx mentions a big name in automotive history, Roadmaster. That’s because the big Buick from a few generations was the last of its kind manufactured by General Motors. GM doesn’t call the Tourx what it is, a station wagon, a body style which undeservedly became a pariah in the automotive business as consumers flocked to minivans in the late 80s and 90s and SUVs and crossovers after the turn of the century. 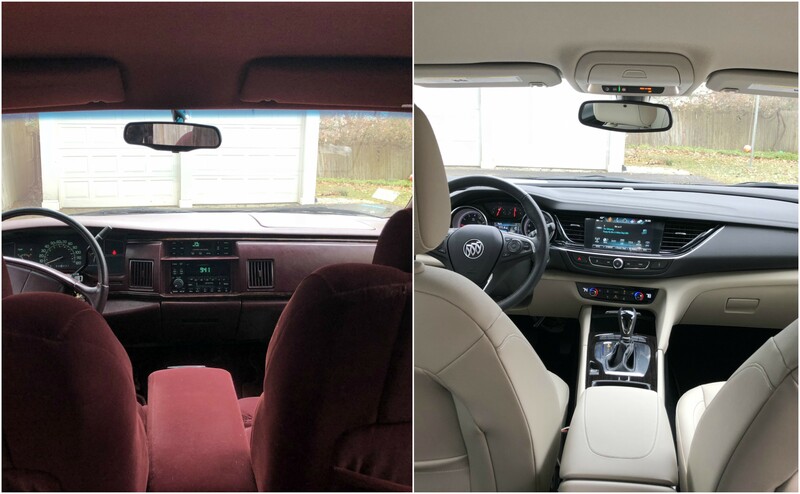 These auto journalists instinctively label the Tourx a wagon, but These reviews I’ve been reading only have glancing comparisons to the Roadmaster Estate Wagon and primarily focus on the new kid in town, perhaps because there aren’t that many Roadmasters in good condition still on the roads. The last one rolled off the assembly line in 1996. 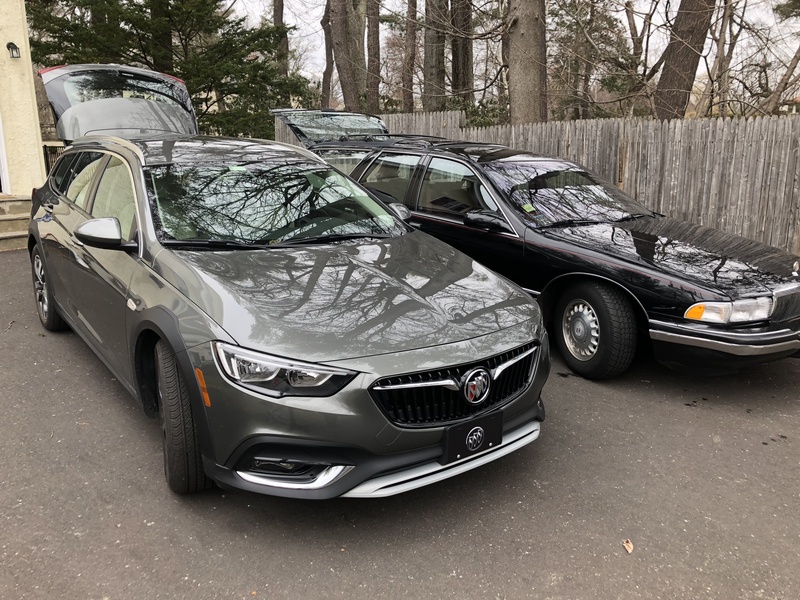 With just over 60K miles, my 22 year old Roadmaster is about as good you’ll find out there and is worthy of a head to head comparison with its new descendant, so when the given the opportunity to test the Tourx I took it, and promptly parked it right next to my beloved station wagon. I’ve always loved wagons. We had three of them growing up, all Fords, including one laden in faux wood contact paper I learned to drive in. Just about every family I knew had a wagon, and if you didn’t have one, your favorite television families drove one. There was a Plymouth on “the Brady Bunch,” a Pontiac on “My Three Sons,” and a Mercury on “Dallas.” Wagons were ubiquitous. Suddenly wagons are cool again. The Cooper family on the new hit “Young Sheldon” has one, a Oldsmobile Vista Cruiser showed up in a Super Bowl commercial, and a Ford Country Squire is a supporting actor in the Oscar winning film “Three Billboards Outside Ebbing, Missouri.” Wagons are now on the minds of creative people who put them on everything from t-shirts to mugs to potholders to wrapping paper. Yes, I did wrap some gifts in this paper this past Christmas. Some of the foreign automakers never dropped wagons from their lineups, but the domestic automakers did, until now. 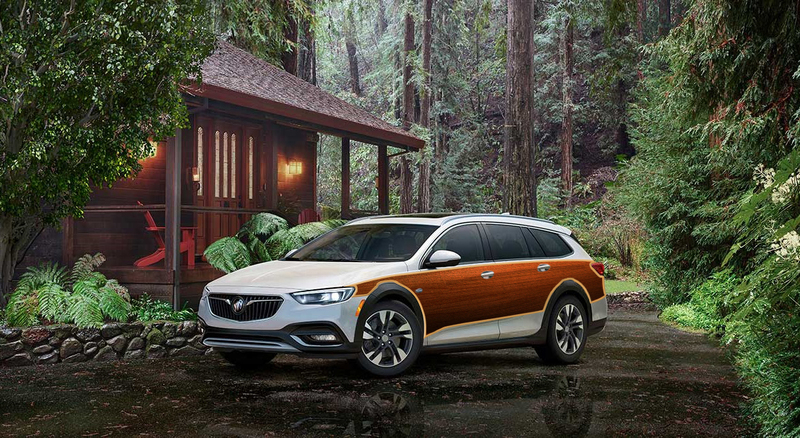 Buick must sense the percolating feelings of love out there for station wagons, and wisely decided to resurrect an American icon. So how did the new Buick wagon compare to my vintage one? LOOKS: Regal takes this category. It’s sleeker and sportier. TECHNOLOGY: Seriously? I love the Roadmaster’s “concert sound” audio system and all, along with it’s “high tech” clock, but how does one compare the electronics of 1996 to 2018? The Regal takes this category too. SPEED: I’m not a race car driver, but I think based on my experience driving both, the nod goes to the Roadmaster. It has a V-8 LT-1 engine that is nearly identical to the power in a Corvette. It truly is the master of the road on the highway and makes road trips effortless. 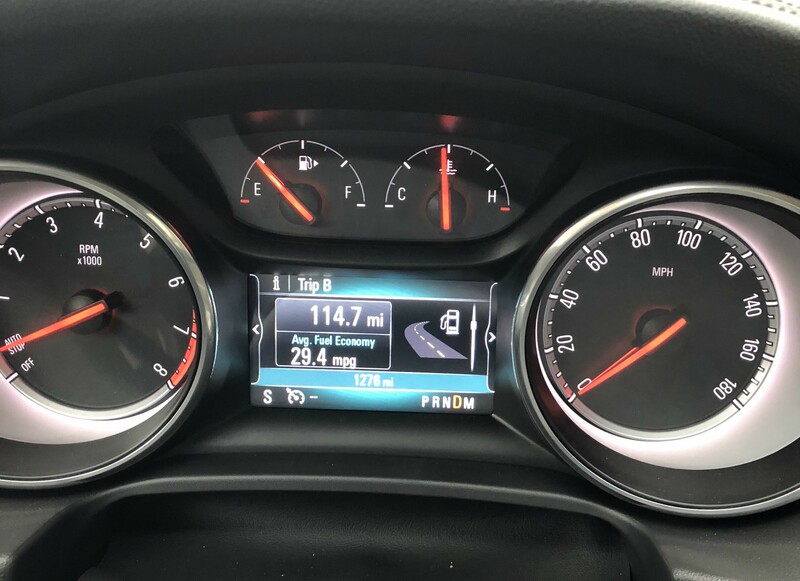 MILEAGE: The Regal was a very pleasant surprise. I took it on a 230 mile round trip from Hartford to Haverhill, Massachusetts and it averaged 29.4 MPG both ways. The Roadmaster, on a good day, gets 22, but on highway trips I’ve logged as high as 24.2 MPG. COLORS: Roadmaster takes this one. There were 10 choices offered in the 90s wagon, only 8 offered in 2018, and two are shades of white. 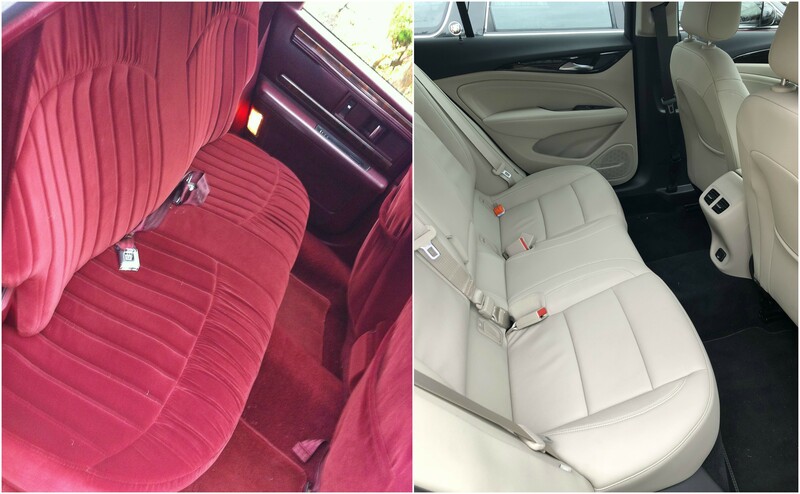 INTERIOR: Roadmaster squeaks by thanks to more color choices and offerings in leather and velour. The Regal comes in only two, and I don’t think the tan would hold up very well with kids and bikes and dogs. The other color offered is black. Is anything better than that cherry colored velvet? SUNROOF: Regal wins this. It’s much bigger than the Clinton era hauler, and it doesn’t have the silly shades (that have never worked well) its predecessor has. PRICE: The Regal I tested had a sticker price of $37K My Roadmaster stickered for $29K, 22 years ago. Due to inflation, edge goes to Regal. Both are on the lower end of pricing; the Regal can top $40K completely loaded, and some Roadmasters went as high mid $30Ks. My previous Roadmaster (read about that below) was loaded to the gills and I’m told sold for $34K. By the way, I paid $5000. for my Roadmaster in 2014 and it had 18,000 miles on it. NAME: c’mon. Nothing has more chutzpah than Roadmaster. Road and Track put it on its list of best car names of all time. In an industry where there are names like Flex, and forgetful alphanumeric monikers, it’s sad the name Roadmaster is in the history books. An aside, I test drove the retro-ish Ford Flex and liked it, but I couldn’t get past the name. 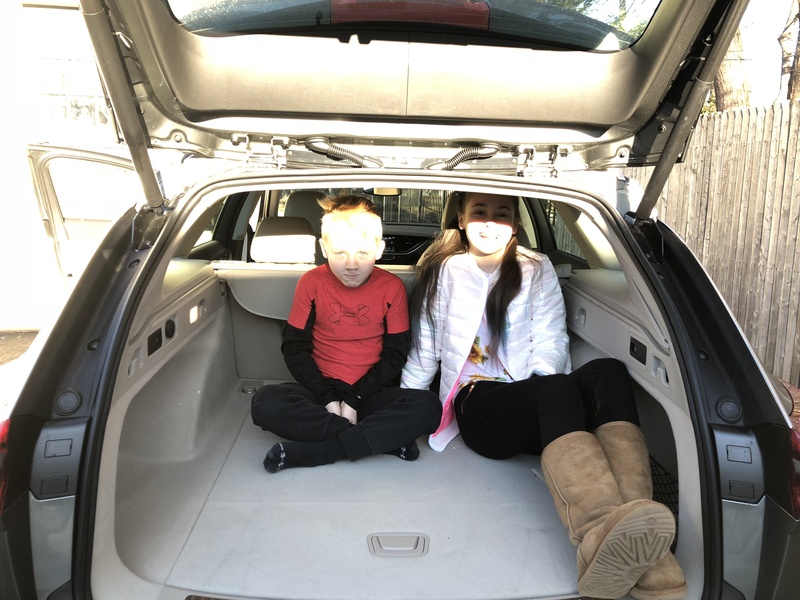 PEOPLE STORAGE: My kids gave this category to the Roadmaster, and until the Regal has a rear-facing third row, their opinion isn’t going to change. So there you have it, if you are looking for a station wagon, the Roadmaster eeked out a win over the new Regal. The bad news, you can’t have one, at least not the one tested here. I’m not selling. I should point out I liked the Tourx and it is on our list for the next family car, but in my judgement, it is lacking one important option. I’m not an auto reviewer nor a product endorser, but I will recommend one thing to the makers of the new Buick wagon: bring back the woody. They’re going to have to do it eventually anyway to keep up. Fiat Chrysler is resurrecting the iconic Jeep Grand Wagoneer. When it does, faux wood on the side of wagons will be the new hot thing. When an old Wagoneer recently showed up on the show “This is Us,” social media erupted in nostalgia, so much so that Jeep itself responded. Jeep got crazy free publicity out of that and it made people feel good. I think when people see a station wagon with the wood paneling it makes them feel warm and nostalgic. If it doesn’t something is wrong with you. LOL. I have friends who can’t wait for the new Wagoneer. If it is the only woody on the market, I’m going to want one too. My wife and my co-anchor used to drive them, and fondly remember their faux maple festooned cruisers. The first automaker to bring back a woody will get all sorts of attention, and will be featured in the media, television shows and commercials, who knows, maybe even a potholder. The second to do it? Crickets. Forgot the home page link…..
Like Marshall Loveday, I too am a member of the Station Wagon Forum (I go by the name 101Volts there) and I have found your Station Wagon articles through the forum on multiple occasions. From my perspective and location in rural Pennsylvania, people seem to have started enjoying Station Wagons again in 2014 or so which is when I picked up my 1990 Mercury Grand Marquis Station Wagon (though I just felt nostalgic over Station Wagons for some time before that and in 2002/2003 I told Father I’d buy one for him;) I put the Mercury in a few car shows, an adoption event in a mall and although it’s not in perfect brand new shape it does look better than “Very Good” in both car shows and in person. I’ve had more than a few lookers including on the Highway. One woman was leaning out the passenger window taking a photo at 70 MPH. Besides the return of the Station Wagon (which might show up for better fuel efficiency reasons over SUVs and lower rollover chances,) I’m still wondering when or if we’re going to get long cars again at least the length of a 77-96 B Body (a rough 18 feet;) the length of 71-76 B Bodies (rough 19.5 ft) might be overdoing it. I suppose once engines and transmissions are both fuel efficient enough and air friendly enough we might get cars with longer noses and tail ends for better crash protection.